Empire is constantly evolving to thwart the people’s movement. Imperialism has changed significantly since its beginning. The period of traditional colonialism during which the imperial powers literally occupied colonial lands mostly came to a close around the end of World War 2. The shattered empires of Europe could no longer occupy vast lands around the world. Their weakened armies could not match the people’s movements and decolonial struggles that emerged. Decolonization did not mean real independence for most former colonies. Even though former colonies were granted formal independence, real power was held by the imperialists. 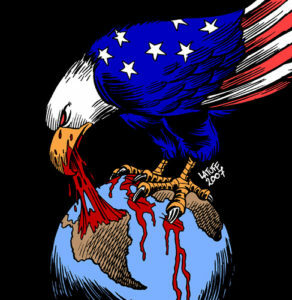 The United States emerged as the main leader of the Western imperialists. The nature of the Soviet Union also changed in the last decade of Stalin’s life. Like all major socialist revolutions, the Soviet Union wasn’t defeated by invasion by imperialists, but by the internal enemy, by revisionism. The revisionist Soviet Union emerged as another imperial bloc, but one that opposed the West. These two imperial blocs contended for power over the countries of the Proletarian World. Both created vast neocolonial empires that channeled resources and labor from the neocolonies to themselves. The entire Proletarian World became a battleground between these two imperial blocs. All the world was threatened with nuclear destruction by the power struggle between the Western and Soviet imperialists. Today, empire is changing again. Just as the revolutionary movement learns from our past, just as revolutionary science evolves, the forces of reaction also learn. Even though there remain some conflicts in the world between powerful countries, these conflicts will not result or even risk world war. The cycle of world wars predicted by Lenin’s generation is over. Both world wars so weakened the capitalist system that proletarian revolution was able to erupt on a massive scale. During the first world war, the Bolshevik revolution created a wave of liberation that would not only spread throughout the old Czarist empire, but also into Eastern Europe, even Germany. Not long after World War 2, China, a quarter of the world’s population, raised the red flag. Although defeated now, at the time, these waves of revolution shook the capitalist system to its core. The capitalists do not want a repeat of the past. Thus the capitalist system has evolved. International institutions have arisen to mediate conflicts. National capitalism is surpassed by transnational capitalism. The global capitalist class is less and less tied to particular countries, rather they’ve become more and more transnational. The capitalists have a mutual interest in jointly exploiting the Proletarian World in a way that does not lead to intra-imperialist war. Thus the economies of the bourgeois countries are more and more intertwined with each other such that intra-imperialist wars do not make economic sense. At the same time, the Bourgeois World, the wealthy imperialist bloc, is penetrating and controlling the Proletarian World in ever new ways. Transnational corporations play a bigger and bigger role in today’s economy and politics. There is an increased overlap between big corporations and government. As governments have downsized, corporations have been charged with managing those sectors of society once under the state’s control, or in other cases, corporations have been charged with the sell-off of massive state sectors as economies of weaker countries are forced to restructure by their creditors, the World Bank, International Monetary Fund, etc. At the same time, non-governmental organizations (NGOs) have an increased role as the traditional state has declined. The network of NGOs taking on the role of social services, population management, etc. are beholden to global interests, not to the communities they serve. They too are part of the new globalized, neoliberal face of empire. Two antagonistic worlds have emerged, the Bourgeois World versus the Proletarian World. Contradictions within the Bourgeois World are becoming less and less antagonistic. Power and wealth are becoming more and more socialized. Social divisions have become less and less relevant in the Bourgeois World. The Bourgeois World is a world of comfort. The Proletarian World, by contrast, is a world of poverty, hunger, environmental devastation, instability, etc. The contradictions between the rich and the poor, between those who hold political and economic power and those who do not, is sharper than ever in the Proletarian World. The gap between the rich and poor grows. The dogma of the past is not enough to win. Ideology is a weapon. If we are to really win, we must develop ever more advanced revolutionary science to place into the arms of the masses. With all our hearts we follow the Leading Light of the most advanced science applied to the task of reaching real communism. We are the organization of the global poor, exploited, truly oppressed and their real allies. We are the organization of the true proletarians, the Proletarian World, who “have nothing to lose but their chains.” We have a world to win.